India being a country full of diversity and migrants are one of the countries making the most out of VoIP Services. As we all know, Indians love to talk and keep in touch with their loved ones no matter where they are. Be it in Nigeria or the USA, Indians will make sure they call their loved ones every now and then. With regard to the commercial bit, a lot of outsourcing happens which is why VoIP Service plans are essential. 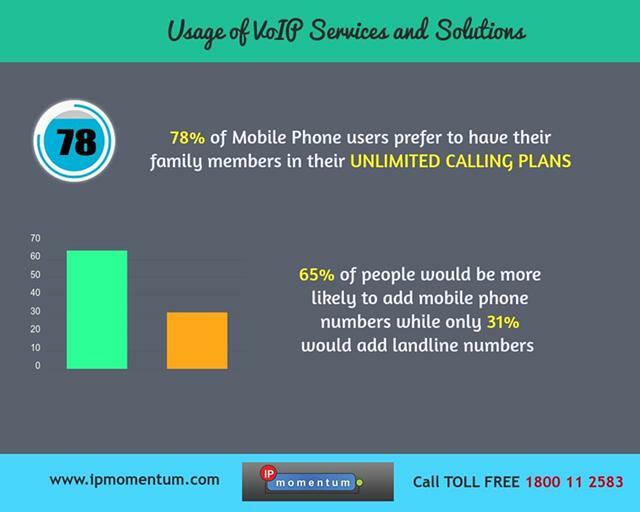 The amount charged for each call made all across the globe has now reduced drastically all thanks to the internet world's VoIP Services. Now, businesses are saving hugely because of VoIP Services. Reasons being, they can sit at their desk and contact their CEOs or whosoever in the USA, for instance with the help of video conferencing. Not just that, every call made out of India and vice versa is made at such affordable rates that it's simply unbelievable. It's a fact that most Indians live in countries like the USA, UK, Dubai and so on due to reasons like better job opportunities and so on. As a customer, you must choose VoIP Service plans which provide you with service plans which provide you with the cheapest possible VoIP Services irrespective of the country you have to make the calls to. Make it a point to have a look at the additional features provided by your VoIP service provider. Go for the VoIP service plan which provides you with the features which you will possibly need. There are several features available for you to choose from like video conferencing, click to call, faxing, holiday number and so on. Check out the network connection. See how well it's worked for others by reading through the testimonials and reviews. Also, several VoIP Service providers which find out alternatives to find out whether there's good network connection in that particular region. Also, 98% of the times, there's great network availability. So, don't you worry! Make sure that your VoIP Service provider is flexible enough to change your VoIP Service plans when required. You obviously wouldn't want to pay too much, right? There can be changes every now and then which your service provider must be fine changing with. You need to see how good their customer service is. Whether it's good or not so good. If it's ain't that great, please move onto the next one as it's pointless for you to buy a VoIP Service Provider's services which cannot help you out when in need or when there are updates and offers in the company and so on. It's always a great plus point to find a VoIP Service providers in India which provides VoIP Services to you at the most affordable rates. However, look out for the other criteria mentioned. Only then, sign up for the service. Because, there's no point paying for services which are dysfunctional 99% of the times. One of the most important points are whether your VoIP service provider is transparent to give you information regarding what you're asking for. For instance, when your bill comes more than expected, you should have all the right to ask your VoIP Service provider why that is so and have a look at how much you've spent where and so on. VoIP Services are wonderful! However, you as a customer must know your rights and what exactly you want from your VoIP Service Provider. If you're fine with no flexibility, fine. However, no point regretting later on because someone suggested you a particular company's VoIP Service. Ultimately, you are the one who is going to use it and you are the one who has to pay the bills! So, do your research because once you find the one, it'll be the most satisfying experience ever!